Medelita makes sophisticated lab coats and performance scrubs for the modern medical professional. Their coats and scrubs are so nice that everyone on the crew wanted one! Our first project with Medelita consisted of 2 videos: a product video for their M3 lab coat line, and a brand video for the company. We met with the team several times during pre-production to learn about their products and culture, and to understand their goals for the project. We collaborated on the scripts, and performed all pre-production services necessary to execute the concept. We shot the videos in 1.5 days at their office and warehouse in San Clemente. In post-production, we sent multiple cuts of the video to them for feedback and approvals until they declared the videos finished. 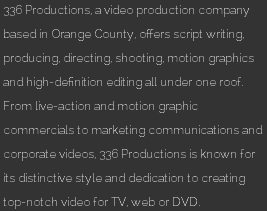 They use the video throughout the web and in their marketing campaigns. The featured video is the brand video (AKA “About Us” video) that shares with the viewer Medelita’s passion and process.